88 by 108 by 99 in. 223.5 by 274.3 by 251.5 cm. Sarah Braman (MA) creates large-scale sculptures that honor the small moments in our lives that, over time, have a large impact on the development of self. Moments such as long and winding road trips, digging into a good book, or spending time with loved ones are important to Braman, and she relays their significance in her multifaceted works. She sources materials such as scrap-yard cars, discarded items from dilapidated buildings, or vintage furniture and fuses them with luminous plexiglass structures and hand-dyed fabrics. This play of found materials against geometric lines suggests the precariousness of balance in one’s life. 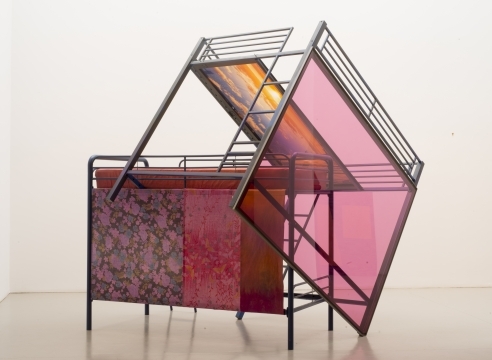 The radiant tones of the plexiglass and the warmth of the textiles offer a redemptive quality to the salvaged objects. Picking up on these thematic threads, for The Autotopographers Braman will create a hut-like structure in which one can find a quiet reading place. Hand selected by Braman, the books in the space are important reads from her childhood, as well integral texts that inform her art practice. 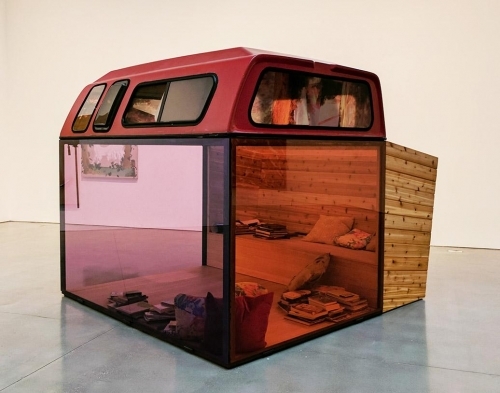 Within the context of The Autotopographers, this reading nook—reminiscent of a child’s living-room fort—reflects the importance of introspection, literature, and time spent with only your imagination. Throughout the run of the exhibition, the artist will host a series of readings and small performances, providing a space for connecting and spending time with each other in a peaceful space.